Few things in life inspire complete awe. Weaving through the intricate limestone karsts and islets of World Heritage-listed Halong Bay is one of them. 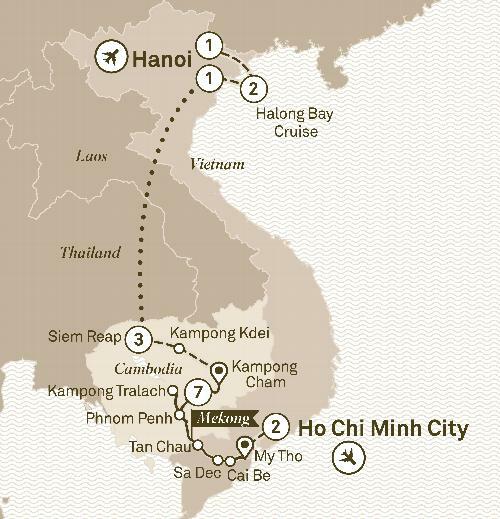 Begin your travels in bustling Hanoi. A place that manages to leap forward whilst still maintaining a deep connection to the past; discover secret places that make this city the artistic and cultural capital of Vietnam. Enjoy the thrilling wonders of Halong Bay, before you travel to Cambodia to explore the heaven on earth that is Angkor Wat and embark on your Mekong river cruise. Journey from quaint upriver stilt houses to the allure of Phnom Penh, before cruising back into Vietnam.